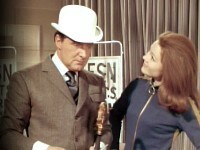 Emma is practicing fencing lunges at a dummy hanging on her apartment door, and Steed enters with an invitation card skewered on the tip of his 'brolly bearing the slogan, "Mrs. Peel—We're Needed!" Back at Emma's flat, Steed informs her that they're having dinner "on Venus." Amateur astronomers are falling prey to an odd affliction: They apparently die of sudden advanced age. All of them have been observing Venus, and according to a member of the British Venusian Society, Earth is being invaded by Venusians! But the clues point to something a little more down-to-earth. Considering the era and genre of the program, this episode features some surprisingly good special effects, such as the laser burning its way through eye charts toward Emma's head—although there are some pretty lame effects as well, such as	spray-on snow used to suggest "bleaching." Favorite guest Philip Locke as Dr. Primble, the nearly-blind eye doctor, makes a memorable oddball, and his threat on Emma near the end is spine-tingling. The lasers also make a wild sound, part of which is actually a bullet ricochet played in reverse. The color series marks the beginning of a new-style tag, usually comprised of some witty exchange in Emma's apartment. Personally, I preferred the "riding off into the sunset" tags. It also marks the start of the "Mrs. Peel, We're Needed" teasers. Don't tell anyone, but lasers don't do anything shown in the episode—least of all make a loud sound. But then, it is just a silly TV show. If we can accept telepathic man-eating plants from outer space, I suppose we can live with noisy lasers. Recognize the abstract painting in the time-lock vault? The sharp eye (in this case, Alix Sensale's) will notice it also appears in "Epic." 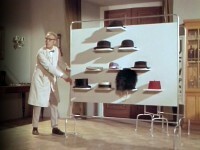 And Tony McKay spotted it in "Wish You Were Here." Tony also reports that the abstract painting, both pre- and post-laser blast, has appeared in several ITC productions, including The Saint, "The Power Artist." By the way, does some of the music in this episode sound vaguely familiar? Use your imagination, and you might recognize a mutated form of "Venus" from Holst's The Planets. Contributed by Benjamin Adams. Acronym Alert: BVS is the British Venusian Society. Stanmore City Hall was the exterior for Brigadier Whitehead's stately home. (It was also used in "The Winged Avenger.") On Location provides a better and more recent view. 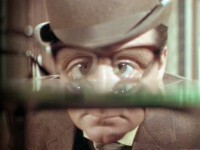 Steed's eye exam is one of the best little scenes of the season. Faced with death by laser beam, Emma quips, "It's quicker than a peroxide rinse."